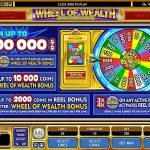 Wheel of Wealth Special Edition is a video slot game from Microgaming that allows you to feel the thrill of spinning a wheel and earn some prizes. This is a newer game that keeps its traditional action in the first place, fruit machine symbols and the higher prizes are coming from the more luxurious symbols like cars, private jets and diamonds. But, that is not all, there are a couple of bonus features to keep your levels of anticipation high throughout the game play. Wheel of Wealth Special Edition is powered with a scatter, a bonus icon and a wild which substitutes for all the other symbols and doubles the wins. The bonus symbol activates the Wheel of Wealth bonus if you manage to land 5 symbols on an active pay line. This is where you have the chance to play the Wheel of Fortune game. Just spin the wheel and wait to see your prize. Landing 3 or 4 bonus icons will bring some rewards as well. You need to pick one symbol and reveal not only a coin prize but a WOW symbol. This symbol is a ticket to the main bonus feature, the Wheel of Wealth game. Since, the only way to activate the bonus features is to land the symbols on an active pay line, so in order to win more and activate the features more often we would advise you to play on more active pay lines as possible. Wheel of Wealth Special Edition is a great addition to the Microgaming portfolio. The game play is fairly easy and relaxing and the features are activated on a regular basis so you feel like you are making progress all the time. If you love this version why not try playing the original? 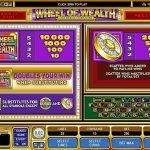 Play Wheel of Wealth a 3 reel slot by MicroGaming.